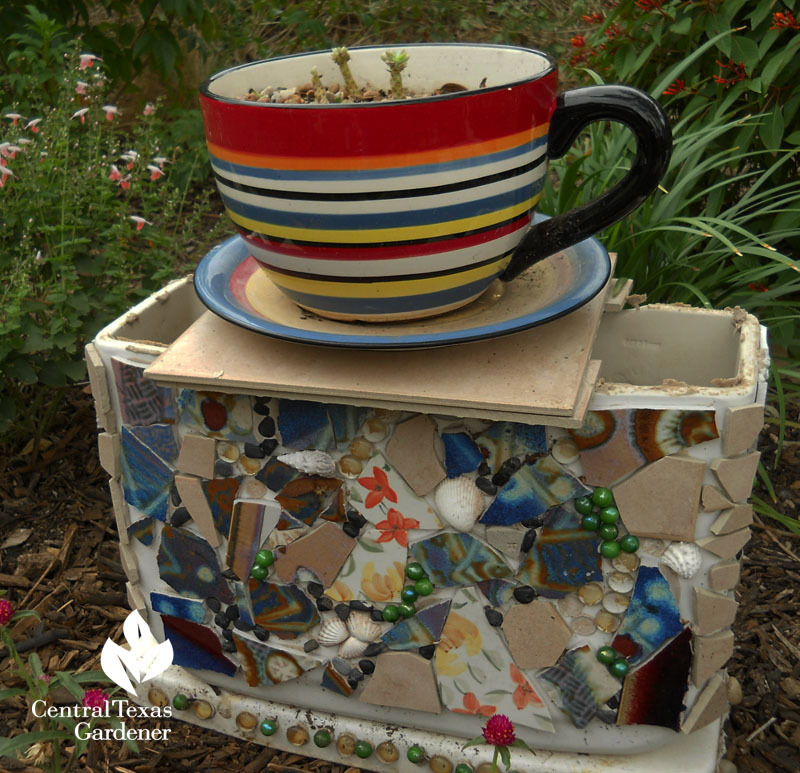 “Are you going to use that?” Gardeners are masters at recycling—plants, curbside scavenges, leaves, whatever. Give us somebody’s leftovers and we’ll find a way to use them! You can have a ton of fun without a ton of money. 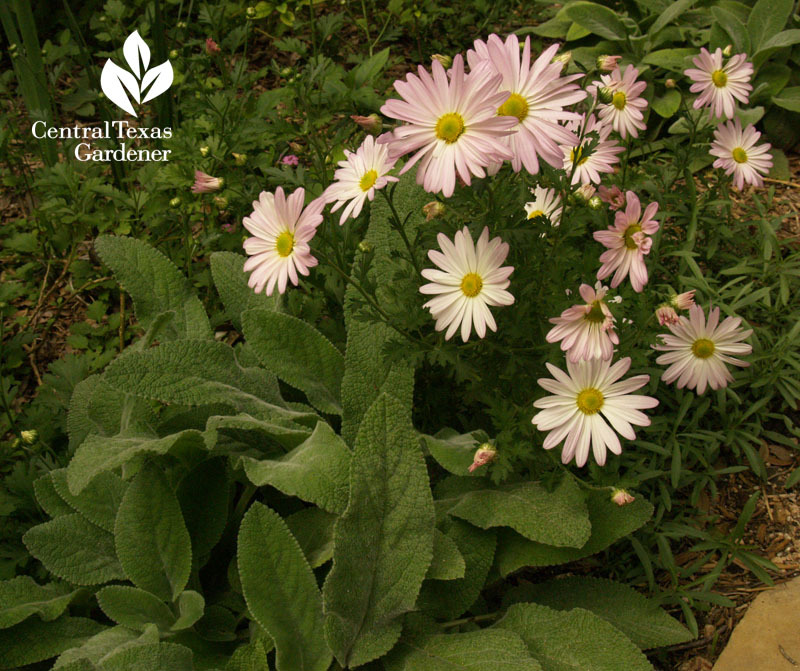 Plants are recycling themselves, too, just in time to feed insects as temperatures drop. 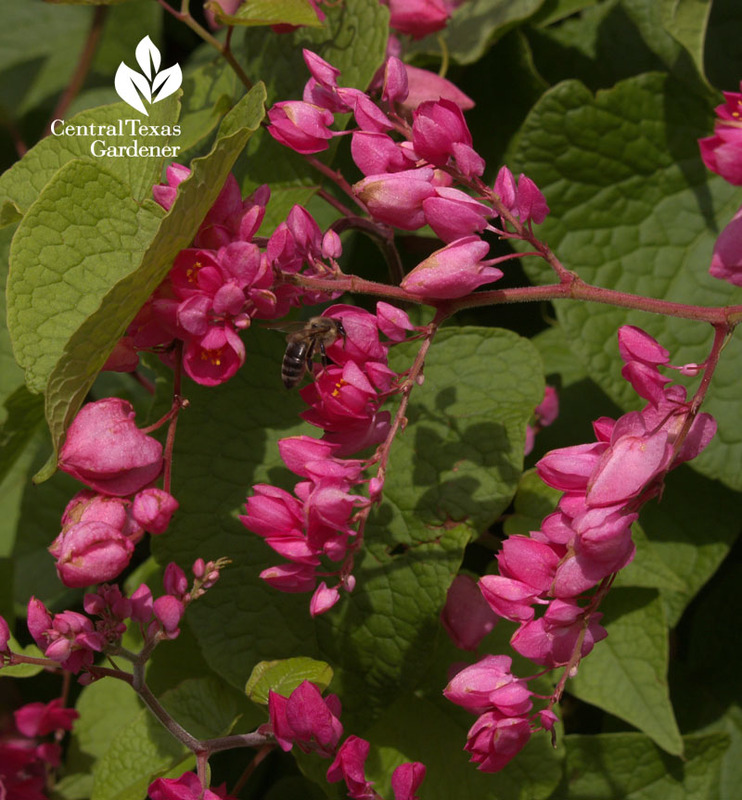 Butterflies and bees head straight for fall sensation queen’s wreath (Antigonon leptopus), also called coral vine. 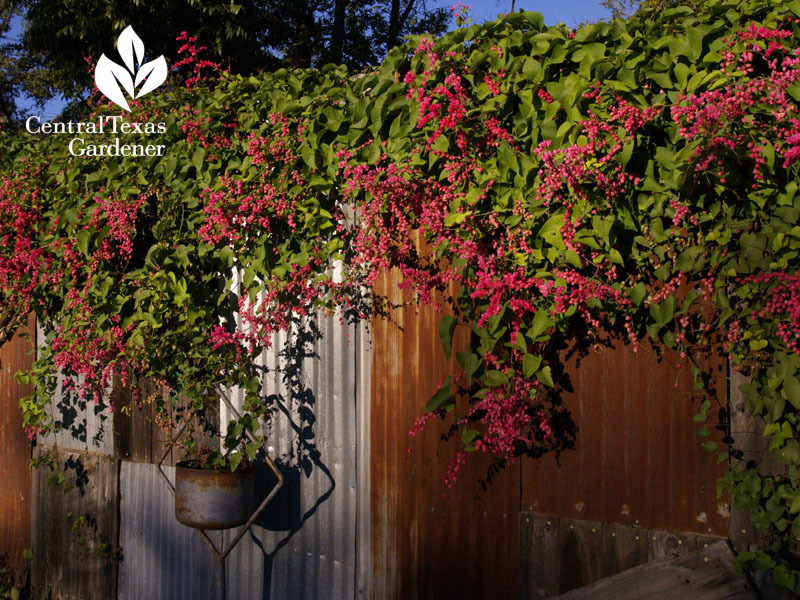 Isn’t this a cute recycled fence with coral vine? In my garden, resilient ‘County Girl’ mums didn’t look so hot a month ago. 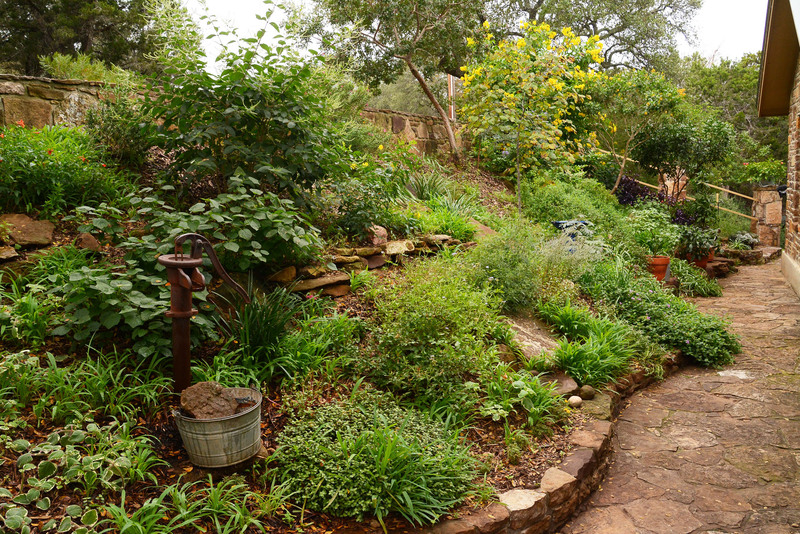 All it took was a breath of cool air for them to shoot up over ‘Helen von Stein’ lamb’s ears and native groundcover snake herb (Dyschoriste linearis). 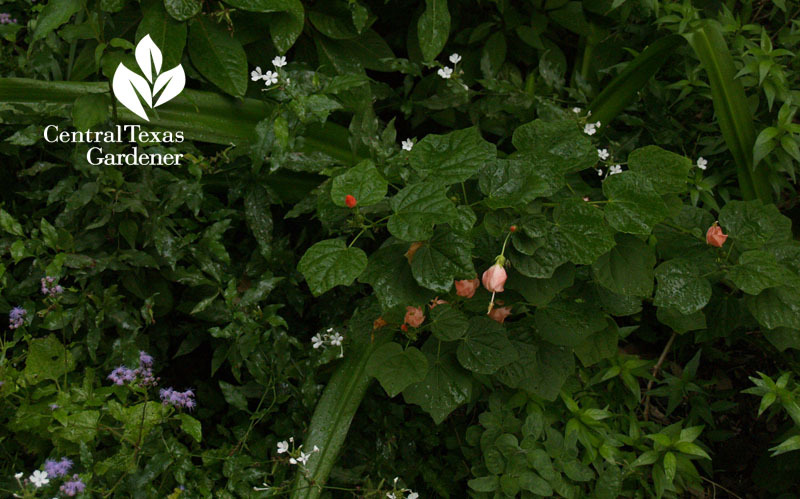 My new pink Turk’s cap sulked a bit this summer, since I planted late. Now, it’s firmly committed to join native Plumbago scandens and one of the blue mistflowers (Conoclinium coelestinum). Maggie’s looking prettier than ever. 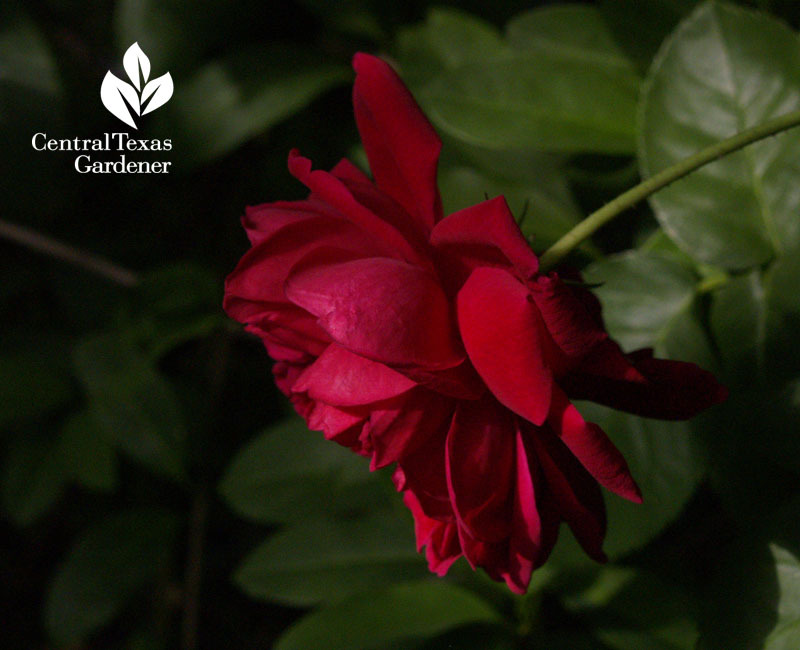 Dr. William C. Welch from Texas A&M found this rose on family property in Louisiana and recycled it into the trade for all of us to enjoy. Here’s something he just told me: rub your fingers on the stem right below the flower for the scent of black pepper! 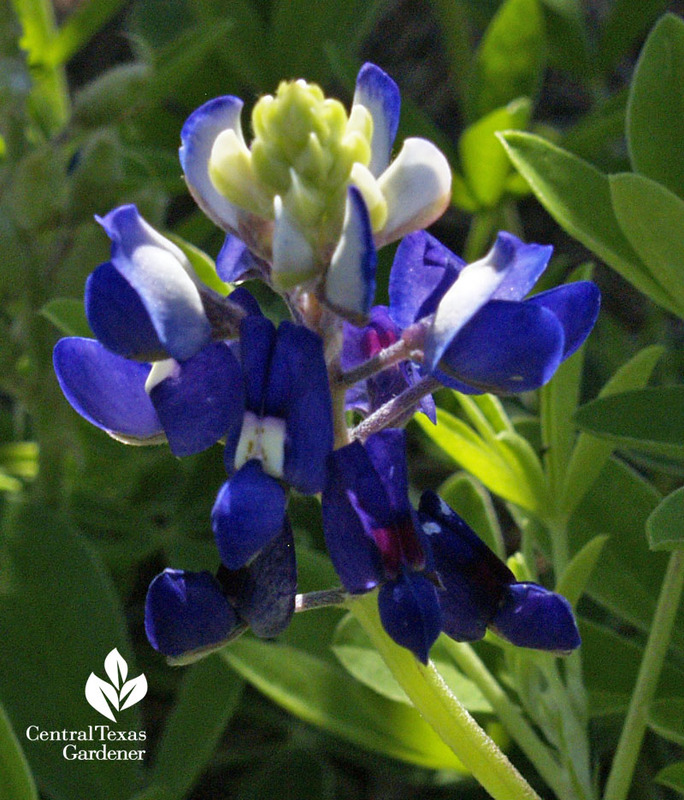 Now here’s a glorious recycle, ‘Lady Bird Johnson Royal Blue’ bluebonnet, the latest A&M Texas Superstar. 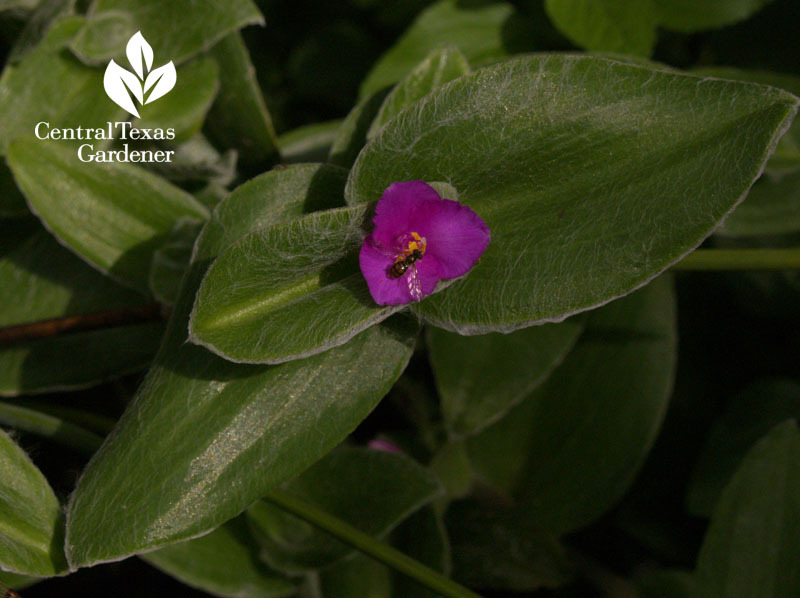 Daphne gives us the backstory as her Plant of Week. 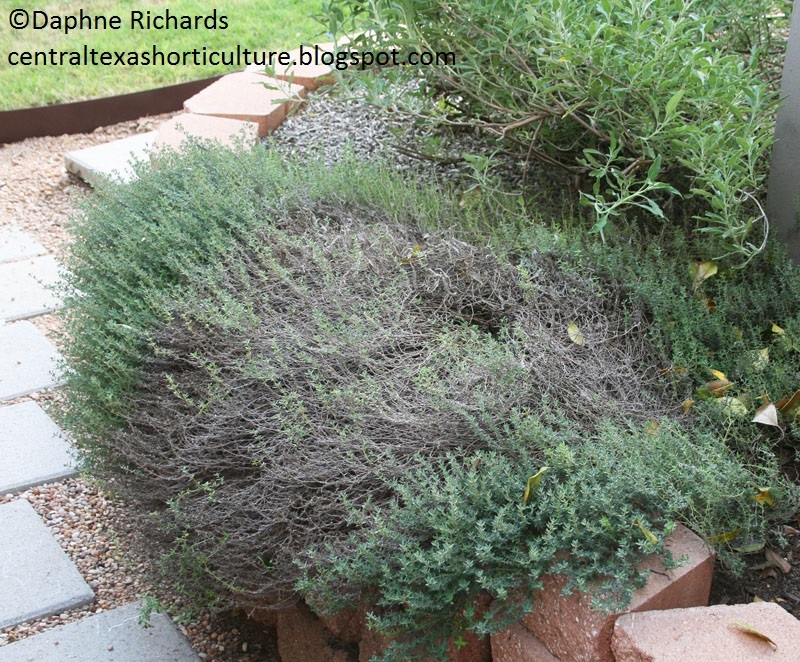 So, do you have thyme that looks like this? One of my first garden mentors told me, “Keep cutting thyme or you’ll lose it.” Daphne explains why this week, when she puts herself on the line as Question of the Week. 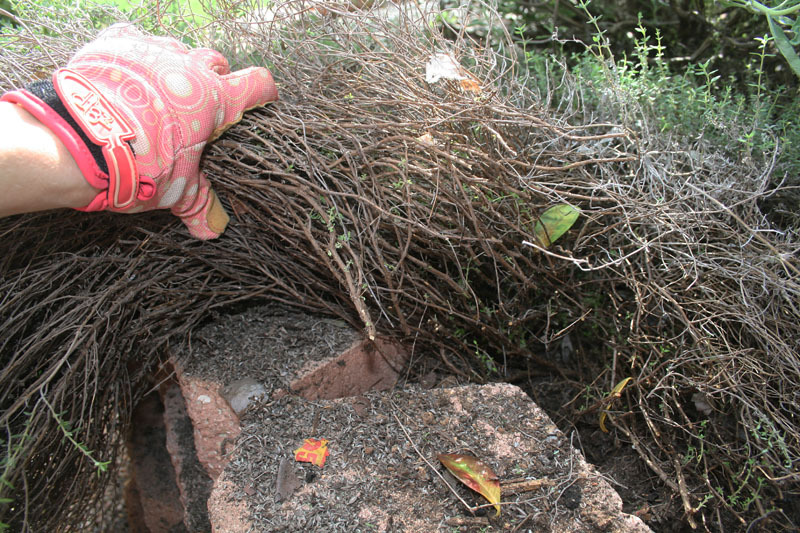 With her busy schedule, she flat ran out of time to deal with her thyme in a timely manner! See how she’s cycling it back into lush growth. On CTG’s tour in Temple, Master Gardener Mary Lew Quesinberry charms her front porch with repurposed wood. 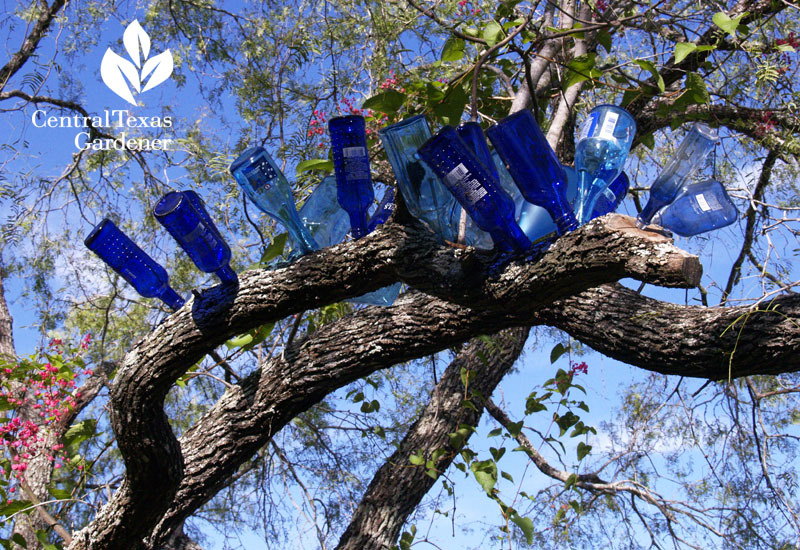 And check out this supreme “bottle tree,” crafted by Lori, blogger from The Garden of Good and Evil. 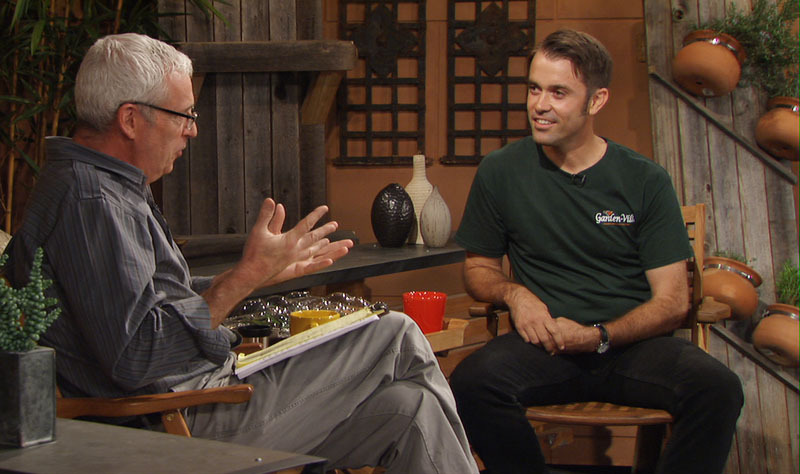 William Glenn from Garden-Ville grabs our imagination this week when he joins Tom with repurposed finds that are inexpensive and fun. 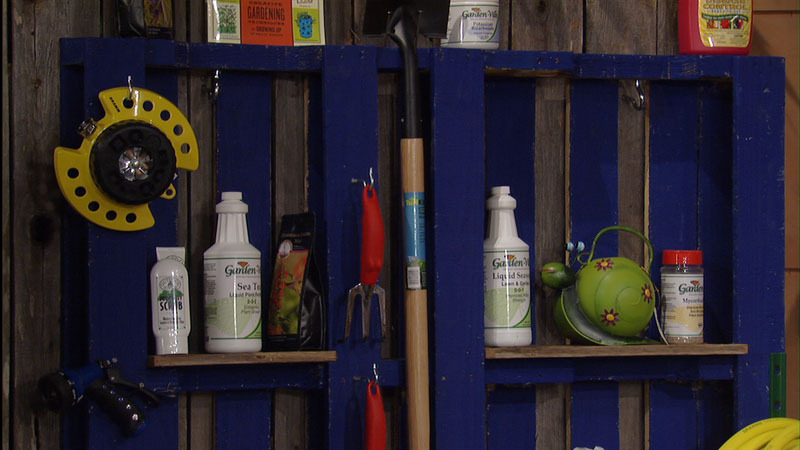 Garden-Ville converted pallets that once held materials into pretty inventive tool and supply storage. 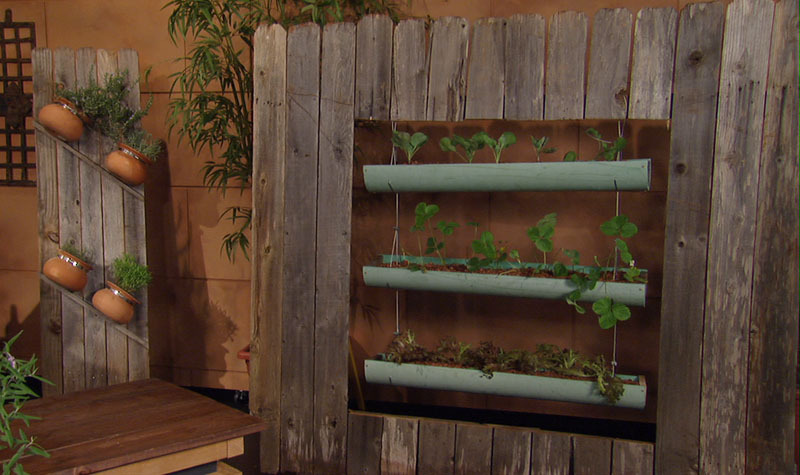 Here’s a planter made from PVC pipes, suspended on old fencing. 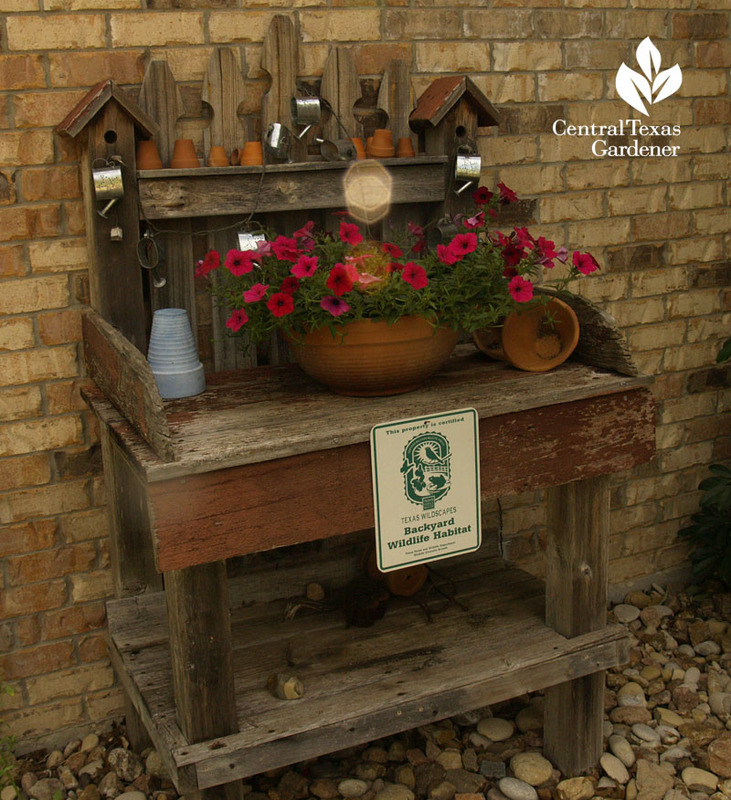 Perfect for the small space gardener! 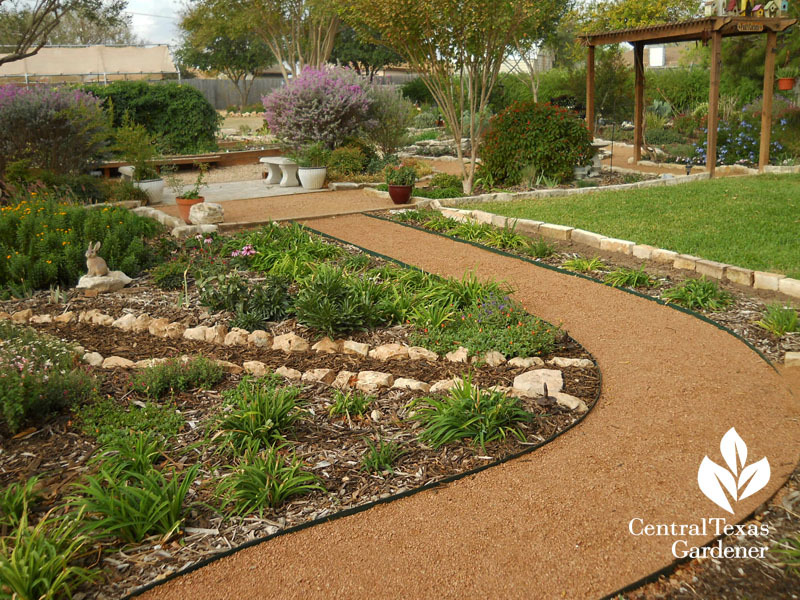 Pecan mulch helps keep in the moisture. In the background: another intriguing way to dress up a fence with inverted pots, sporting plants that like good drainage. 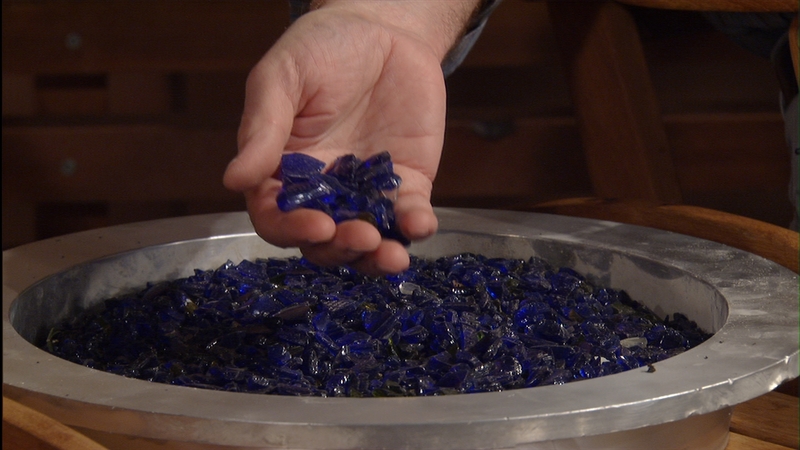 Their Creedmoor location is aligned with Texas Disposal Systems, where you can buy crushed bottle glass. And YES, they have it in blue! 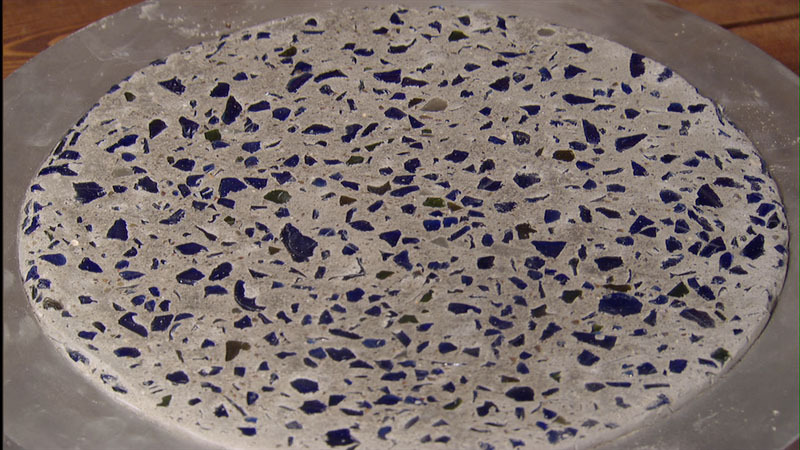 William shows off the glass in homemade concrete stepping stones, framed in an aluminum discard from something or other. You can leave them in the metal or just use it as a mold. 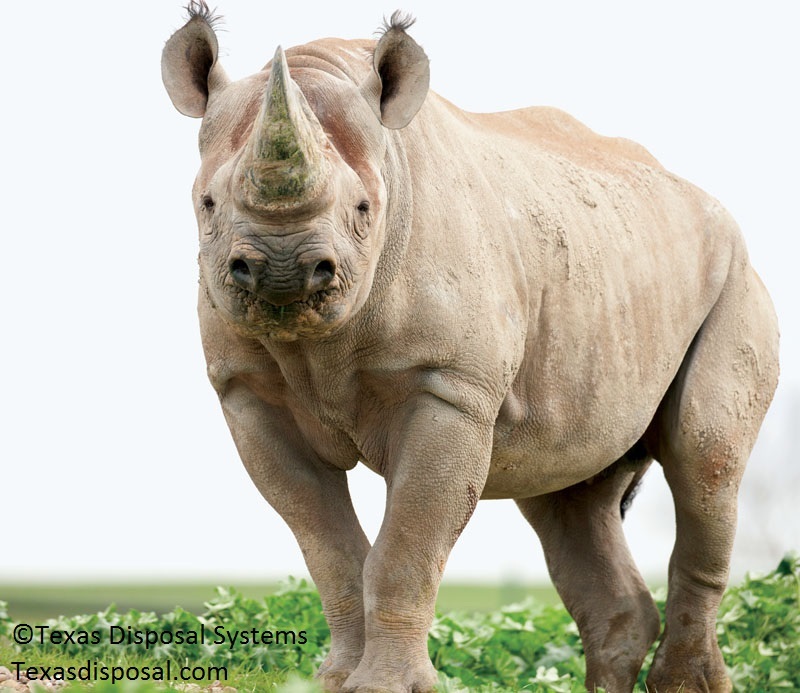 Kids love to visit TDS, too, for the exotic game ranch, where they can meet guys like this. 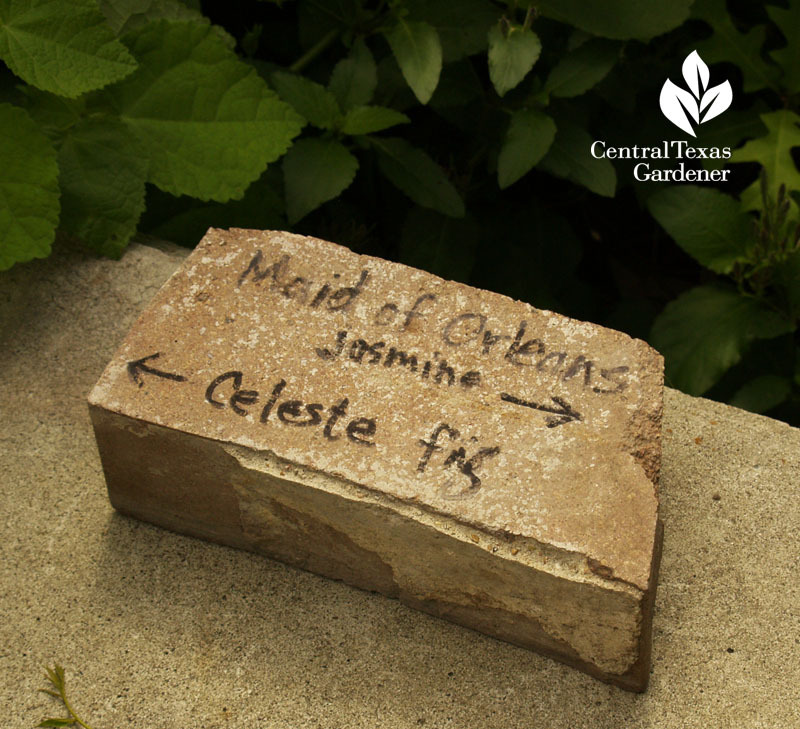 Eric Pedley from East Austin Succulents knows how to recycle a good old thing, too! 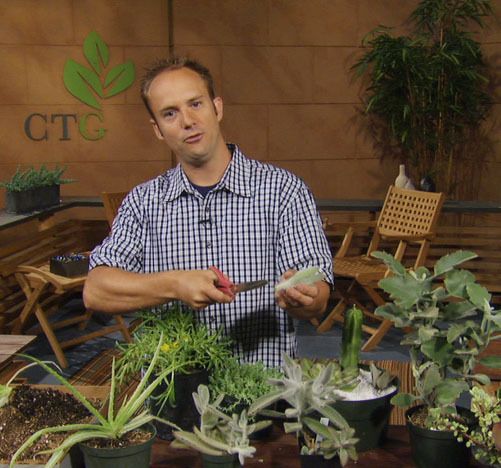 On Backyard Basics, he propagates succulents for a wealth of new plants on a limited garden budget. One of my recycled plants, Cobweb spiderwort (Tradescantia sillamontana), attracted a beneficial hoverfly (syrphid fly) minutes after its fall flowers opened. 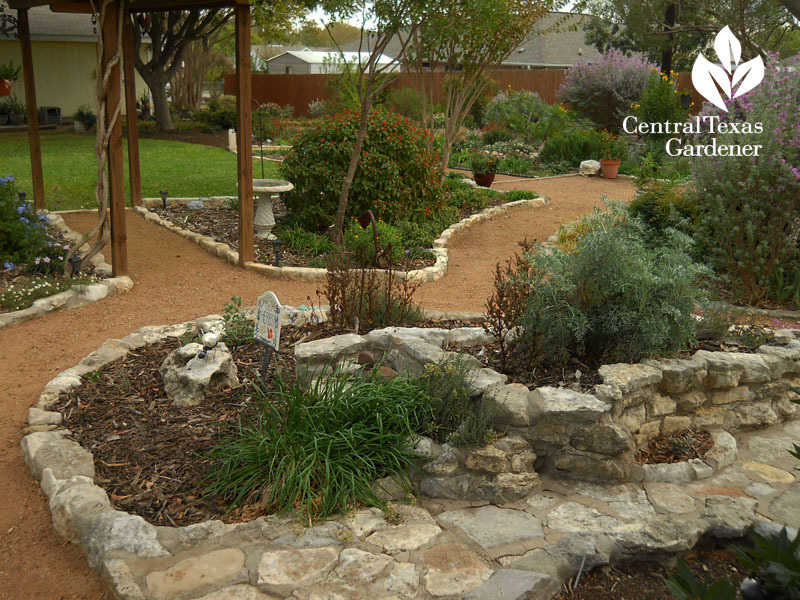 I got this passalong from Paul Lofton in Pflugerville, where he relied on ingenuity and plant propagation to turn his grassy yard into intriguing garden destinations. He and his daughter gave this foundling a pretty new use with their mosaic project. 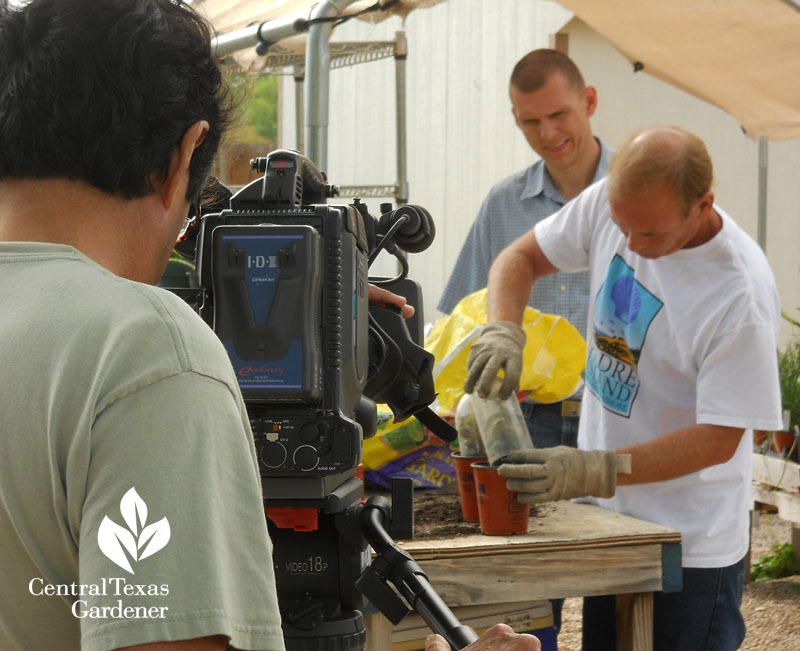 On our visit, director Ed Fuentes captures Paul and CTG friend Matt Jackson, who nominated this garden, to see how to grow cuttings in a recycled water bottle. Here’s our short web extra where Paul shows how to do it yourself. Finally, here’s his whole inspiring story!